Academy 1/72nd scale with scratch cockpit details, aerials, air scoops, radar warning receivers, landing lights and GBU-28 "Bunker Buster". Python AAM from Paragon, all other stores are Hasegawa. Eduard cockpit details. Hasegawa crew. Pre-Isradecals F-15I set (at least in UK) so decals had to be a mixture of Academy, Hi-Decal, Almark, Hasegawa, and Revell. Paints were Humbrol enamel (good) and Humbrol sprays (bad). Liquid poly smeared thin and quickly removed saved project from the now withdrawn and allegedly defective "new formula" Humbrol sprays that don`t hold a light to their original stock. 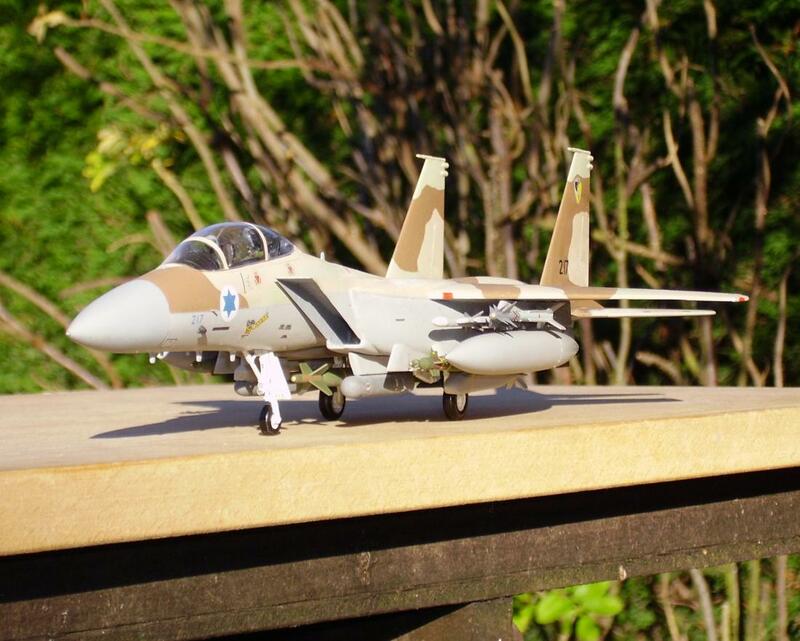 Probably the best basis for an F-15I Ra`am in 1/72nd scale is the Academy kit as it has the "turkey feather" nozzles (which need internal detailing) as an option along with other attributes. Still no middle CFT pylon like other F-15E kits in 72nd scale, the nose gear requires strenghtening, and the forward fuselage fit is pretty poor, but still not a bad kit for its` age at not a bad price.